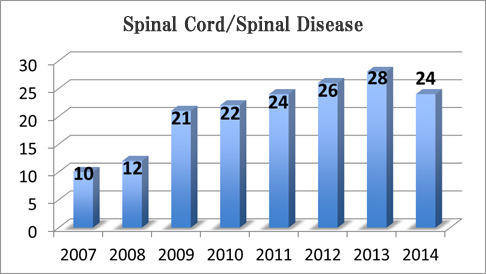 Diseases originating in the spinal cord itself are less common than diseases originating in the brain. For example, while cerebral infarction is a common disease, spinal cord infarction is not. On the other hand, while it is rare to have a brain disorder/encephalopathy caused by diseases of the skull, it is quite common to have a spinal cord disorder caused by pressure on the spinal cord from abnormalities in the spinal column, ligament or intervertebral disk surrounding the spinal cord, or from vertebral subluxation, etc. 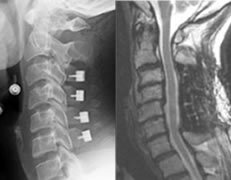 At the Department of Neurosurgery, we treat diseases with neurological manifestation caused by pressure on the spinal cord, including diseases originating inside the spinal cord. This condition does not have a specific set of symptoms. Symptoms range from a slight discomfort on the sole of the foot to more advanced cases with appendicular movement disorder. Some of the tumors originating inside the spinal cord are entirely removable through surgery and others are only partially removable. The patient in the figure on the right had a large intramedullary tumor, but the only preoperative symptoms were numbness in the hands and sluggishness in the lower limbs. After the total removal of the tumor, symptoms did not worsen and the numbness in the hands improved. In many cases, if the pre-operative symptoms are mild, it is uncommon for the post-operative symptoms to worsen in the long run. In this condition, a part (tonsil) of the cerebellum descends, causing blockage in the flow of spinal fluid and the retained fluid creates a cavity in the spinal cord. Typical symptoms include neurotrophic pain in the hands and in the lateral region of the abdomen, deformed joints, scoliosis, and muscle atrophy in the hands. It is often possible to slow the progression of the disease by a procedure called Foramen Magnum Decompression. ※In some cases, Foramen Magnum Decompression is not as effective. Such cases may require syringosubarachnoid shunt. The tumor is located outside the spinal cord, and the symptoms manifest due to the pressure created on the spinal cord. By removing the tumor, the pressure is relieved, and in many cases, the symptoms improve as no new scar is created. For the most part, this is a slow growth tumor, and by the time the symptoms appear, the tumor has formed a large mass. Similar to a benign brain tumor, neurinoma and meningioma are common. More than half of neck movements occur at the junction of the cranium and cervical vertebrae. This is why inflammation and injury often cause subluxation in this area. Especially in children and elderly people, this is the area where “slippage” is likely to occur. In severe cases, the spinal cord is compressed causing various symptoms including numbness in the hands and legs, movement disorder, and sleep apnea. If the subluxation is severe, spinal fusion may be necessary. At our Center, we use a navigation system to make sure that the fusion is performed securely. The spinal cord is housed inside a space surrounded by bones protecting it from direct outside pressure. However, when a herniated disk enters this space or when the ligament inside the bones thickens, the spinal cord does not have a place to escape and is compressed, causing symptoms. When pressure originates from more than one place, or when the pressure is mainly from the posterior side of the spinal cord, surgery called laminoplasty is performed. Intervertebral disks and ligaments compress the spinal cord, causing paralysis in both hands and gait disorder. MRI shows deformation of the spinal cord compressed by intervertebral disks and ligaments. 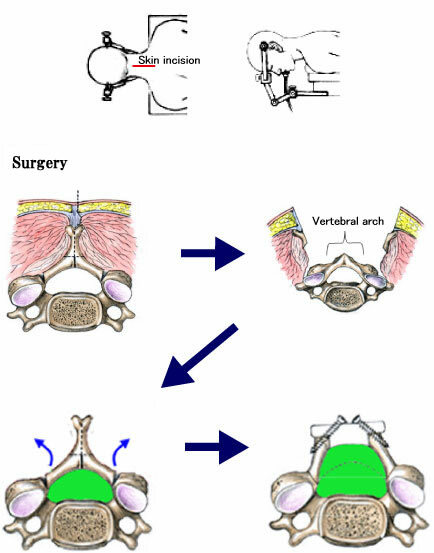 By vertebral arch reconstruction, the pressure on the spinal cord was relieved and symptoms improved. If a herniated disk is pressing hard against the spinal cord from the anterior side, the disk from the anterior side of the spine is removed. In order to prevent instability in the same area, a fusion is also performed. When the pain is severe, this is an effective treatment option. If a titanium cage is used, ambulation is possible by the next day. When the patient repeatedly experiences gradual numbness and weakness in legs in standing or walking, and these symptoms improve when sitting or resting, it is called intermittent claudication. In many such cases, there is a deformity in the lumbar or distention of the ligament or intervertebral disk that causes the nerve to be squeezed. By surgically removing the thickened ligament, the symptoms improve.